Serena Donovan left London six years ago, her heart broken and her reputation ruined by devilishly handsome Jonathan Dane. Now, with her family's future in peril, she reluctantly agrees to return to England and assume her late twin's identity. The price? 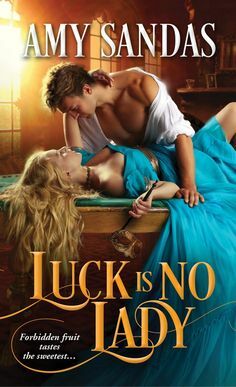 Marry a man she doesn't love and spend the rest of her days living a lie.Jonathan Dane, Earl of Stratford, has become an incorrigible rake, drinking, gambling, and trying to forget Serena Donovan. Yet the moment he's introduced to the prim and proper "Meg", he recognizes the sensual young woman who captured his heart. Haunted by his past mistakes, he refuses to lose Serena again.But convincing her to trust him is no easy task. Claiming his lost love means exposing the truth and destroying the life Serena has sacrificed everything to rebuild. With the future of all the Donovans at stake, and their undying passion capable of triggering yet another scandal, how much will Jonathan and Serena risk for a chance at true love? Serena left England six years ago, after the man she fell in love with broke her heart. But on her voyage home to the West Indies, her sister, Meg, falls into the turbulent waves, lost. Now Serena six years later, has no choice but to return to England, to pose as her sister “Meg” and to marry someone she doesn’t even love, and to live a life she knows she won’t be fully happy with. However she has her mother and her sisters welfare to think about. When she reaches England, she comes face to face with the one man that hurt her, Jonathan, the Earl of Stratford. Now she is facing a big dilemma, she is engaged to Will, who has no idea of her real identity, and one she must keep secret from, and deal with all the emotions that come swirling back with Jonathan back in her life. Serena has no idea how she is suppose to pull it off, but will she make the right choice that could benefit all parties involved? Or choose a path that would only destroy her? Jonathan, once fell in love with Serena, but because of pressure from his family and because he was young and foolish, betrayed the one woman that made him complete. When he came to his senses it was too late, and he lost her to the depths of the sea. Then he see’s “Meg” who has returned to England, who is engaged to one of his closest friends. But there is so many things about Meg that remind him of Serena, and he swears it is Serena he is looking at, not Meg. Jonathan knows he must convince her to trust in him again, and in the love they have always shared? When Serena first came to England, she fell hopelessly in love with Jonathan, and just when she thought things were finally falling into place for her, he betrays her in the worst way, and she flee’s England to go back home with her sister in tow. But when she loses the one person that has always been on her side and supported her, her life changes forever. Now she is coming back to England, and come face to face with Jonathan once again, and starts to feel mixed up inside, and doesn’t know whether or not to listen to her mind or to her heart? Confessions Of An Improper Bride is the first book in the Donovan Sisters series. I have come to just love Jennifer Haymore’s books. I just jumped right into this one, knowing that it was more than likely that I would enjoy it. I found that I truly enjoyed this one, there were so many aspects of the story that were fun and kept me engaged and involved in the story. I just loved how Haymore just reel’s you in, and keeps you satisfied with this complex plot, and strong characters. Jonathan is a very deep character, at first you wonder if you will really like him, but I was so on his side all the way. You can see his dedication and love he has for Serena, and the way the author portrays the feelings felt by these characters are heart wrenching. I definitely felt like this story was a very sensual and engaging romantic tale!! A Lovely Story That Will Make You Fall In Love Again! !